The Grimeton Radio Station, Varberg is the original station site for an ultra-longwave radiotelegraph transmitter that was used for wireless transatlantic communication in the 1920s. The site consists of the transmitter equipment, including the aerial system with six 127 m high steel towers, and a residential area with housing for the station staff. 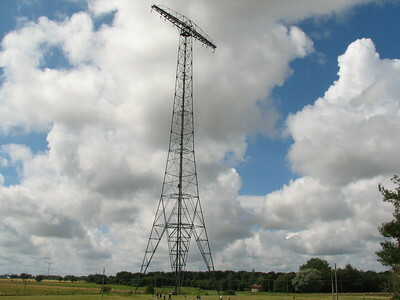 The transmitter was constructed between 1922 and 1924 by the Swedish-American engineer Ernst Fredrik Werner Alexanderson. Alexanderson (1878-1975) was responsible for a number of innovations in the communications field. The structural engineer Henrik Kreüger constructed the six antenna towers, the architect Carl Åkerblad designed the neoclassical buildings. 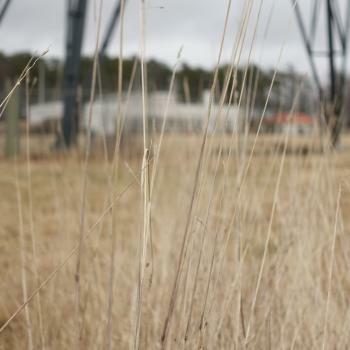 The Varberg station is the only one left from a global network that was planned after WWI to enhance communication between countries worldwide. It was used until the fifties for transatlantic radio telegraphy to Radio Central in Long Island, New York. It has been kept in working condition since and is still in use by the Swedish Navy. I didn't expect too much of this site, but the people running and conservating it have done a good job making the radio station's history come alive. A new visitor center has been constructed near the heritage objects / monuments. There's a cafe, a souvenir shop and you can buy tickets for a tour. After paying 50 Swedish kroner I was picked up promptly by an English speaking guide. The visible parts of the site consist of the six huge masts, a pool of cooling water with fountains, the pretty main building and two lesser buildings. Signals were only sent from here - a receiving station used to exist about 30kms away. Varberg (or Grimeton, to be more precise) was part of a global network that connected with New York. In the cafe a mural shows the other locations of this ring: Poland, England, mainland USA and Hawaii. The introduction video shown at the site emphasizes the need for transatlantic communication in the early 1900's, as many Swedes had emigrated to the USA. This longwave radio station shortly filled the gap between the vulnerable underwater cables and shortwave (which was introduced widely in the year 1927). In the surprisingly pretty Neoclassistic main building (which wouldn't look out of place in some fine Italian town), the machines that were necessary to operate the system are on show. Messages in morse code arrived here from a telegraph office in Gothenburg, where companies and the general public could deliver their messages to be sent overseas. These morse messages were then transmitted all the way to the New York via the ingenuous transmitter. The site of Grimeton was especially chosen because of its flat coastal land and because there is a clear line from here to New York bypassing Scotland, Denmark and Norway. In all, an educating visit to one of the most orginal WHS: the only one dedicated to telecommunication so far. Visited Grimeton radio station with an English guided tour in August 2018 (I booked in advance through the official website for 120 SEK). It is rather small, but contains all the original equipment (produced by General Electric in the USA) in excellent condition plus some other related exhibits. Today radio station is occasionally used by amateur radio enthusiasts. The station is striking example of the pace of technology development. The wall mural shows 9 radio stations from Hawaii, USA (central radio was on Long Island), Poland, Wales and Sweden but only Grimeton station survived in its entirety. (Another murals probably with some irony compares the site with Giza pyramids, Great Wall and other big elephant site!). Totally agree with previous reviews that the site is unique, pleasant and interesting. While the Swedish list is lacking in terms of world class sites, they definitively have a few odd and peculiar sites well worth exploring, Grimeton being one of those. During the first world war communication lines had been cut showing the need for cable less communication. Long wave radio transmission was a first try at this. Radio Corporation of America set up a network centered in Long Island, New York, to connect the world. Sweden joined the effort as during the war families were unable to communicate with their relatives who had migrated to the US. Grimeton connected to the RCA network in 1924 and it was also the last site to do so. By 1927 long wave radio transmission was already deprecated and eventually replaced with short wave transmissions. As such, most of the sites were torn down. If other sites had remained the obvious choice would have been to inscribe the whole network. The site in Grimeton remained in use for longer as long wave transmissions can contact submarines which short wave transmissions fail to do. The Swedish navy used Grimeton as a backup site and kept the site operational till the 80s. By then this was a historic landmark. Nowadays the still fully operational site is put into use three times a year, one being Christmas. The next larger town is Varberg and it’s well connected by train to both Copenhagen and Gothenburg. However, from Varberg it’s still quite a distance to the station in Grimeton. Knowing the scarce public transport options in Scandinavia on weekends I was a bit worried how to get there. Google maps shows very infrequent busses (at least in winter) to the station. Those aren’t really all that helpful schedule wise. However, you can go to nearby Gödestad more or less every hour (bus 651 from the train station) and from there it’s a 40min walk through the Swedish country side to get to the radio station. You even pass a 5th century AD burial site and the huge antennas on the horizon will guide your way. Check google maps for schedules. And be mindful as there are no sidewalks. In general the field with the antennas can be visited all year. If you want to enter the main building you need to arrive when the site is officially opened. During the winter months this is only the case one Saturday each month. Check the website; I got lucky. English tours are run at 13:00h which works well with catching the bus back from Gödestad at 14:40. The tour is helpful to actually appreciate the site. If you arrive on a day where the site is closed, you still can take peeks through the windows I would guess. The larger site is still in active use, but for different frequencies. Our guide said seeing they already had antennas built in Grimeton getting more permits for new antennas was easier than elsewhere. As such only one of the original antennas is accessible and the rest are fenced off. Ticket prices have gone up considerably since Els’ visit. I think I paid 130 SEK or so. The guide was pointing out that very little to no financial support was provided by the Swedish government for the country’s world heritage sites which may help explain the little progress on their list. 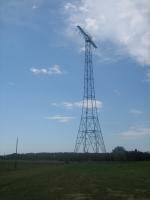 In the case of Grimeton the funding is done via a trust fund whose main income is renting out the antennas on the site. I found Varberg rather pleasant and ended up staying an hour longer than anticipated. The castle and the coast line make for great pictures. If the sun is shining, that is. Be mindful of the strong winds, though. I visited this WHS in July 2016. Although I had visited the country once before, this is the first WHS I visited in Sweden and it didn't disappoint. 45 minute guided tours in English (Day shift) of the radio station are held at 13:00 and at 15:00. I arrived at around 11:00 and spent some time hiking alongside the antennae, reading the information boards, exploring the underground bunker and taking photos. The station is rightly proud to be a WHS and there are signs everywhere to display its inscription. The UNESCO plaque is just next to the visitor centre besides the water cooling 'fountains' while the actual UNESCO inscription certificate is displayed inside the radio station, above the entrance. An informative 20-30 minute video is displayed and I would recommend watching it before the tour as the tour really complements the video shown. The young tour guides really make an effort to give an overview of the main highlights of the station, its importance and its world heritage inscription. I was really surprised to find out that the tour guide knew about WH travellers and that she actually was an interested "beginner" herself. 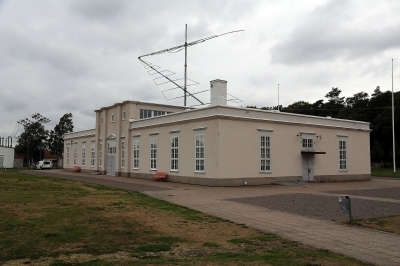 The Grimeton Radio Station (SAQ) is the last remaining fully-operational radio station of the 8 which were originally linked to Radio Central on Long Island, US (5 US stations + one in Caernarvon, Wales, one in Warsaw, Poland and this one in Varberg) which has the only working Alexanderson alternator radio transmitter in the world. It is one of those industrial heritage sites on the list that can be appreciated by all, even if you're not so keen on industrial heritage sites. It will also help younger people appreciate modern technology breakthroughs which we sometimes take for granted. This is how the station was operated back in 1920s: somebody who wanted to send a telegram would visit the local telegraph office. 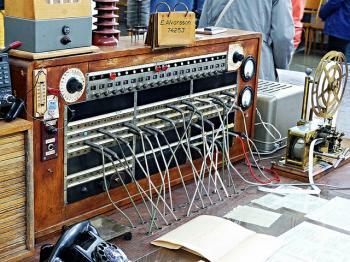 The contents of his telegram would be transmitted with Morse signals via the radio central in Gothenburg to the Grimeton Radio Station through telegraphic wires. From Grimeton, the transformed wireless Morse signals (the telegram) would be sent to the United States and forwarded to the desired recepient. The highlight of this WHS is perhaps the way in which the wireless Morse signals were transmitted, i.e. 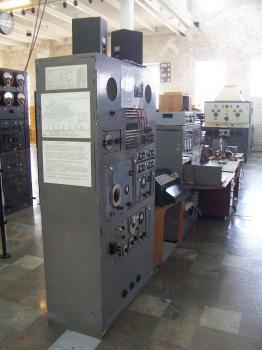 using the longwave transmitter consisting of 4 main parts: the auxiliary system used to control the transmitter, the Alexanderson alternator creating the power needed for the antenna current, the magnetic amplifier modulating the carrier wave with Morse characters and the multiple antenna transmitting the signal out at 17.2 kHZ. The Grimeton Radio Station still transmits at least twice a year, once at the beginning of July on Alexanderson Day and once on Christmas Eve. Since my visit was after Alexanderson Day I made an extra effort to install the SAQ software (http://dl1dbc.net/SAQ/) on my laptop to actually receive the beeping signal. On the day I wasn't that impressed but now that I visited the station and understood the process behind such a great pre-electronic breakthrough I can really appreciate its importance. From looking at the positive reviews from some of my most trusted commentators on this site, I already knew that this was going to be a little more interesting than it first sounded. What I found certainly reinforced the reviews below and I found this to be a real gem of a WHS. The site comprises of the radio station building and the long field of antennas stretching for 2km westwards. I actually got a good view of these towers the day before as I drove on the main road south, and from the fortress in Varberg proper, they looked pretty impressive and mixed in well with the rather beautiful wind turbines that lined all of the E6 that I drove on. The presentation at the site was impeccable; the new visitors centre was a rather beautiful modernist cube, with lots of information and World Heritage themed goodies. The guided tour was pitched really well, it was thankfully was not exceedingly long. This meant that it did not get bogged down in the functioning of the machinery, which is important and interesting to some, but as a casual tourist I was glad it was kept to the basics. One thing that really impressed me was how the importance of the machines was highlighted. Standing in front of a contraption that sent the signal out to the masts, the tour guide explained how this mechanism was run almost non-stop in the early years of the radio station. It pumped out Morse code messages almost continuously and the sum total of this data over a year was roughly 2MB (approximately the same as an e-mail with a photo attachment). This really helped me understand the importance of this site; it is the best surviving example from the dawn of international wireless communication, something which has a massive effect billions of people's everyday lives. After the tour I had a wander around the site by myself taking some photos, before heading back to the visitors centre. I sat down with a delicious Världsarvsbakelse (World Heritage pastry!!) to watch a short documentary explaining the history of the site in the broader context of Swedish emigration to the USA and more general trends in global communications. This is a pretty unique WHS and exceptionally well presented and its proximity to the charming town of Varberg make it a little gem of a World Heritage Site. This is one of the sites that you just visit to tick them off, but then turn out to be quite pleasant. I'm not really an expert in technical matters, but the importance of this station in the early days of radio technology was well presented in a guided tour, a movie, and a small exposition (there is a brand new visitor centre with a café). After the tour, you can explore the site on your own, and there is a trail with informative signs leading to the massive antennae. It should be noted that even though the site is called Varberg Radio Station, it is actually located in the village of Grimeton, easily 12 km away. There are occasional buses, but since I had to rush to catch one of the 2 daily tours in English, I took a taxi. It is also recommended to spend some time in Varberg, a pretty seaside resort with an impressive castle and a quite un-Scandinavian beach ambience. A great monument, lovingly preserved by a country that knows how to honor its greats sons. You deserve a Nobel prize! I have bought and read the English version of the book about Alexanderson by Bengt V. Nilsson: also very worthwhile. The Netherlands also have a rich history of early longwave radiotelegraphy. Unfortunately, the famous station Malabar on Java near Bandung was blown up and of its counter station, Radio Kootwijk in the middle of my country, only the main building survived. I hope these two stations will exchange information, so they can display pictures of eachother's installations. The Radio Station of Grimeton is easily accessed, slightly east of Varberg. Once, in the 1920:ies, Grimeton was part of a global network of long wave radio stations, linking the world for both business and personal telecommunication purposes. The station consists of six majestic 127-meter high steel towers and – just as majestic - transmitter equipment, housed in the station building. Today, Grimeton is the only station preserved in this global series of stations, a technology developed by Swedish-American Ernst F.W. Alexanderson. Next to the station building is a small museum and café where you can browse through the history of telecom as well as buy your tickets for the guided tours. From "Varberg Radio Station" to "Grimeton Radio Station, Varberg"